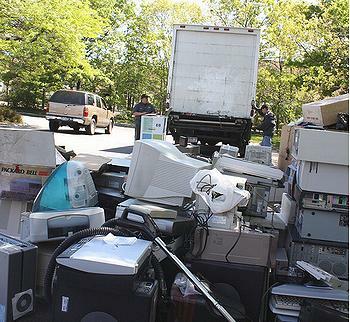 CHICAGO, Illinois, July 5, 2011 (ENS) – The Basel Action Network, a toxic watchdog group, today announced that Chicago Heights, Illinois electronics recycler Intercon Solutions will be the first company denied e-Stewards certification status. This certification is available to electronics recyclers who can demonstrate that they operate in a truly responsible manner. BAN’s denial was based on “compelling evidence” that Intercon Solutions has been engaged in exporting hazardous electronic waste to China. Intercon Solutions has claimed in brochures and on its website that it does not export any used electronics entrusted to it for recycling. However, on two separate occasions BAN investigators photographed and tracked containers of electronic waste leaving property leased by Intercon Solutions in Chicago Heights on its way to China. BAN alerted Hong Kong Environmental Protection Department of the hazardous waste shipment and Hong Kong officials required that the shipment be returned to the United States. Hong Kong law forbids the importation of hazardous waste electronics such as cathode ray tubes and batteries. The import by developing countries of such wastes from the United States is also illegal under the United Nations’ Basel Convention. The e-Stewards qualification program for recyclers began with a group of recyclers committing to the Electronics Recyclers Pledge of True Stewardship and undergoing an independent audit. In 2009, Basel Action Network released the e-Stewards Standard for Responsible Recycling and Reuse of Electronic Equipment which set forth requirements for becoming a Certified e-Stewards Recycler. Recyclers that have been qualified under the Pledge program have until September 1, 2011 to get certified to the Standard by an e-Stewards Accredited Certification Body, accredited by the American National Standards Institute, or ANSI. The certification is available to all electronics recyclers. The final decision by BAN to deny the certification to Intercon Solutions took place only after an on-site audit had been conducted and after direct discussions between BAN and Intercon Solutions failed to convince BAN that Intercon Solutions had not exported the toxic containers. Such export is a violation of the e-Stewards Standard for Responsible Recycling and Reuse of Electronic Equipment, and is likely also to violate the importation laws of Hong Kong, the U.S. federal Resource Conservation and Recovery Act, and Illinois State Law governing the conduct of registered electronics recyclers. BAN is the organization that first revealed the primitive and damaging recycling that takes place in countries like Nigeria, Ghana and China, where U.S. electronic waste is broken, melted, and burned often by children and pregnant women, resulting is severe environmental contamination and adverse health effects. High levels of lead, a dangerous neurotoxin, have been found in the blood of the children in Guiyu, China as a result of these dangerous recycling operations that receive U.S. exported e-waste. More recent studies have linked DNA damage to exposure of Chinese workers at these operations. BAN’s initial discoveries of the crisis in 2001 led to the development of the e-Stewards Certification program to recognize responsible recyclers that do not export their toxic wastes to developing countries. “The exportation of toxic e-Waste is harming communities around the world while consumers are being duped into thinking these recyclers are doing good. We need strong laws and robust certification programs to ensure this kind of unfair and damaging trade is stopped once and for all,” said Puckett. In addition to the e-Stewards Certification, BAN and the Electronics TakeBack Coalition support the Responsible Electronics Recycling Act, introduced last week in the House and the Senate. The measure prohibits the export of toxic electronic wastes to developing countries.